Getting ready to set the frames up on the building jig. But I have to build that building jig first. 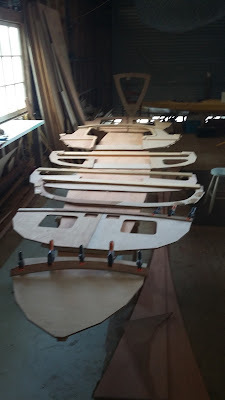 I wrote the text below on Friday evening, went out today between showers and bought the two long pieces and enough for legs and cross pieces for the jig, carried it down the track to the shed and its all ready for me to attack tomorrow. Heres Fridays maunderings plus some pics, please excuse the shaky hands, I was standing on a very unstable stool trying to get a good angle with the camera. ----- A big day? Historic moment? Red letter day? Hardly any of those but it’s a landmark of some sort in the building of Long Steps, I’m off in a few minutes to pick up three 6 metre lengths of 138 x 35mm fingerjointed, kiln dried pine. These will become the basis of the building frame and I’m hoping to have the main part of that put together this afternoon. I’ll get batteries for the laser level while I’m at it, this clever little device saves an awful lot of time. While there are other ways of getting things straight and level having a bright red line exactly on the mark makes it so easy that I cant imagine how I managed before I started using it. I have all the frames built, there are bits and pieces still to put on all of them but the main parts are done. 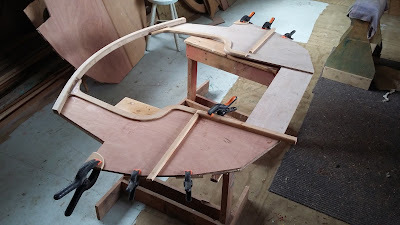 Once the bottom panel is mounted the stem and spine will be set up, B#1 and B#2 fitted, braced straight and level, and I’ll work back from there. I did though set B#3 and B#4 up in their approximate positions the other day, just to get a feel of the space under the cuddy and am pleased. Its slightly wider and longer than the one on SCAMP, and feels much more roomy. Nice, there is space for me in there on a rainy day, and I imagine that I can stay dry sitting out a rain shower while hove to, the stove heating up the water for a cup of tea or soup, then the cast iron frying pan on for toast and baked beans. That’s going to make long passages much less arduous than a purely open boat. To check each frame I’ve laid them out on the bottom panel, the latter just sitting on three sawhorses so it’s a bit swaybacked. But it does give an idea of the boats size. For a sail and oar boat, its big, roomy, and I expect comfortable. Here are some pics. She’s going to fill the shop up somewhat. Frame #5, I'm piecing this one up, this one is halfway back along the ballast tank, thats under the low cross part in the middle, so water and air passages are built in so the tank can be filled and drained. Over the far side you can see the little template I made for the frame heads, that makes getting them uniform much easier. There will be router work, plus some corner pieces added before the frame gets stood up on the bottom panel. Frame #3, the big one at the forward end of the cockpit, under the cuddy roof with the big hatches therein. Here I'm marking out the hatch edge doublers, I use the scraps from the big cuts to do this, as long as the joins in the pieces are 45 deg or better that seems to work fine. By the time I finish this boat there wont be much left in the scraps and offcuts bin except kindling. I don't have a fire but daughter and family do. 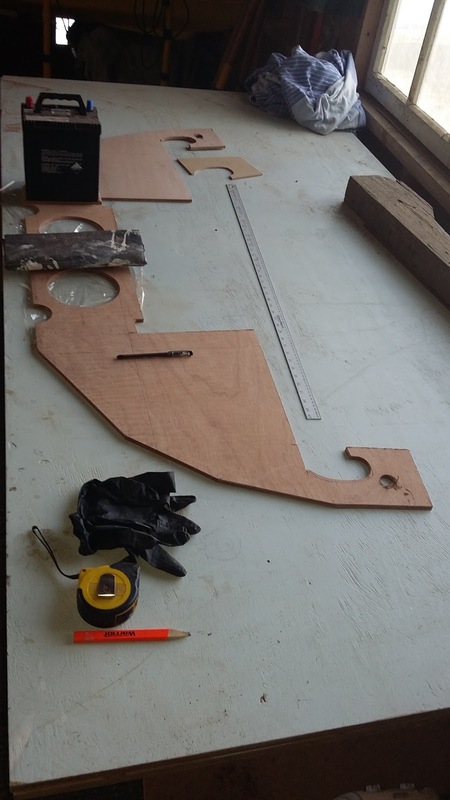 The bottom panel from the stern end, thats just over 17 ft long, the plywood on the floor is the offcut, see the above pic to see what happens to pieces like that. Frames laid out, I'm checking the positions here, will be standing all that up against the bench in the morning and doing some simple carpentery to get the jig built about where that lot is now, so next week I hope to have a pic or three of the bottom set up in its correct curve, with at least the stem and a couple of bulkheads in their final positions. More nice videos, have fun. And one serious one. Roger Barnes is one of the most experiened open boat cruisers anywhere, has put more miles under the keel of his boat than anyone I know with perhaps the exception of James McMullen, and he still got caught. In fact James got caught a little while back, so listen well. Here’s his video telling about the experience of capsize in the open sea. 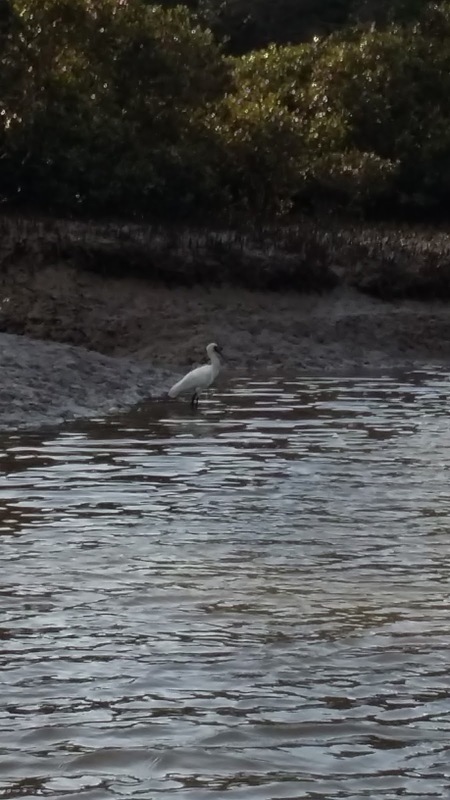 I’ve not put this here to crow abut his getting wet as I’ve done the same a couple of times, but I'm trying to put the case for being prepared for the worst, every time you go out in water more than waist deep! Be ready, be prepared, safety starts at home when you select which boat you build or buy, then carries on with rigging, preparation and storage, all that before you even think about what the weather will be like on the day. It’s a long list. There is much to think about and do before you go near the water. Remember, unlike your car, you cant just open the door and walk home. Thanks Roger for making this video and posting it. It could save someones life. The rest of you, take heed! But the workshop is ok too, at least in the afternoons when things have warmed up a little. With the winter weather having arrived in spades its nice to be inside working on the drawing board, and I’ve a lot of work to do there so perhaps the inclement weather is a good thing. But now and again its good to be able to stand up, straighten the back and go up to the workshop to spend a little time with tools in hand. This morning I cut the panels that will become the bottom of Long Steps, planed the scarf slopes and glued the three pieces together. Long Steps being as long as she is the panel is a bit more than two sheets of ply long, so two 8/1 scarfs are required. It took me all of about 20 minutes to do this, and I mention that because I know a lot of people are a bit apprehensive about making scarf joints but when you have done one or two you’ll find that its easy stuff. In this case I marked across the ends of the sheets at 72 mm back from the edge, that’s 8 x the thickness of the 9mm plywood, stacked the two pieces up and secured them with a clamp on one end of a cross piece set back enough to be clear of the work area, then put a couple of long screws through the other end. Mask and ear protection on, out came the power plane, the one with the tungsten knives in it, and half a dozen careful swipes removed the bulk of the material. 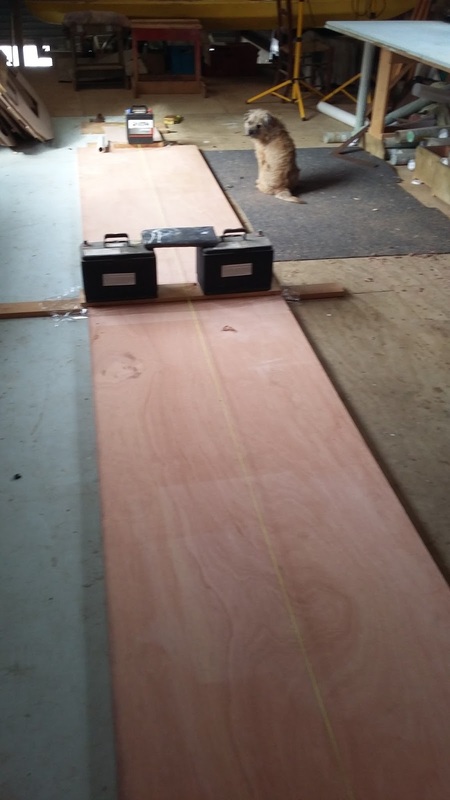 Then with a dead sharp hand plane the slope was completed, cut back to the line, straight from the top to the tip of the slope, the glue lines showing where any bumps or hollows needed to be trimmed out, and that’s it. Next, the panels have been placed upon some lumber, all the same thickness, to support it straight and level, some kitchen wrap placed across the support boards under the join so everything doesn’t get glued together in one big lump, and a string line established to line up the pre marked center line of the three pieces. Glue mixed up, both sides of the joints primed with a thin mix, then some more microfibers mixed in to thicken it to about peanut butter consistency, and the joints “buttered up”. Lined up, each piece put into place and eased together until the lines across match and the stringline lines up with the marks, more kitchen wrap, a piece of nice straight lumber set across the joint and some weight applied. Thats a big panel, 800 wide, nearly 5 1/2 metres long. its brought home that this is a bigger project than any I've done for a while. I had to change the engine batteries in my ship a couple of months ago, and thought that I'd just go and trade them in at the scrap yard. These big batteries are worth about $15 each, but they make darn good weights for jobs like this so they'll be around for a little while anyway. Theres Dennys little dog Indy, he thinks he's my helper, my own dog is down on board the ship curled up by the heater. Sensible dog. Done, leave for 24 hours and its as good as a single piece. There will be a little sanding done to level out any glue squeeze out, I prefer to slightly over fill these joints as the end grain of the plywood tends to soak some up, plus I do rely on the gap filling abilities of the epoxy glue rather than my ability to produce perfect joints. 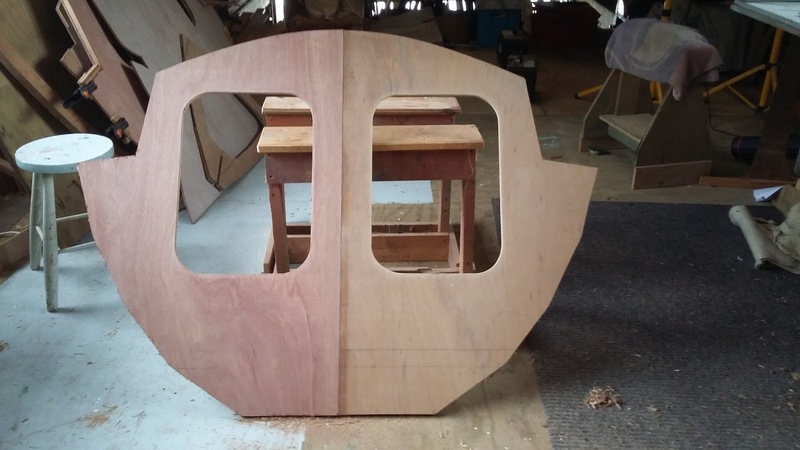 My next job will be marking out the panel from the offsets I’ve picked up on the plan, and as with some of the other parts of the boat this gives me a chance to correct any “offs” in the “offsets”. But that comes up on Sunday, and by the time the next blog posting here comes up I hope to be building the building jig. And, caught up somewhat with the new design that I’m drawing. In the meantime, I'm watching the birdlife, at this time of year we get quite a few coming in to nest and breed. My first winter here saw one pair of Royal Spoonbills nest here, this is my third winter on board and there are now three pairs. A good sign that the breed is doing well. They arrived about 6 weeks ago, and its lovely to see these graceful birds just outside my windows. Wintertime, a good time to work on Long Steps. Its been a wet week, high winds, thunderstorms and torrential rain. Even my little dog hates going out in this, so apart from the usual engineering jobs, two this week, its been a time for at home and inside. Its too cold to draw, I can work ok but the ink wont dry in this very cold high humidity weather, so one of the jobs to do very soon is to move the drawing board and all the odds and ends that go with it back onto the ship. I wont do that when its raining, too much of the equipment is sensitive to the wet, so with luck that might happen tomorrow. I’m working on several bulkheads, B#2 has a curved doubler across the front face to support the foredeck and foredeck king plank, ( that’s the one down the middle) rather than use solid wood for this I’ve made it up from several pieces of scrap 9mm plywood, two layers with the joins staggered. Being glued to the front face of B#2 its not going anywhere, its really just there for the foredeck. So B#2 is almost done, there are a couple of 20x20 pieces that will support the cabin side to bulkhead join and then I can start coating it. B#3 is next, that’s the one at the forward end of the cockpit floor, up under the “veranda” in the cuddy. I’ve just cut out the hatch doors and am busy making up the edge pieces for the hatches. 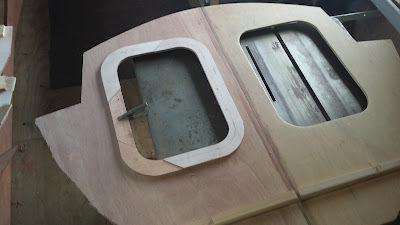 I want to try the PT Watercraft style hatches where surgical rubber tube sealing ring is set into a groove and the hatch door dogged down on it. This requires pretty precise work, and a very stiff edge to the opening so I’ve used 9mm plywood here as well, that makes an edge 18mm thick, nearly 3/4in. We’ll see how it goes, the opening is the right size to take a big So Pac Marine hatch, and if mine doesn’t work out I can run the jigsaw around and drop those plastic ones in. Before I cut the hatch openings. These are wide enough for me to get a shoulder in so I can reach right to the back of the locker forward of this bulkhead. Like so many of the parts of the boat this one is important in that it keeps the water out. And here with The hatch openings cut out. The edge doublers come 20mm in from the edge of the opening that you see here, and I've made the lower edge of the opening at a height where should I swamp the boat, the hatch opening will be above the water in the cockpit. Same goes for when the boat is on its side, the outer edge will be above the static water level. 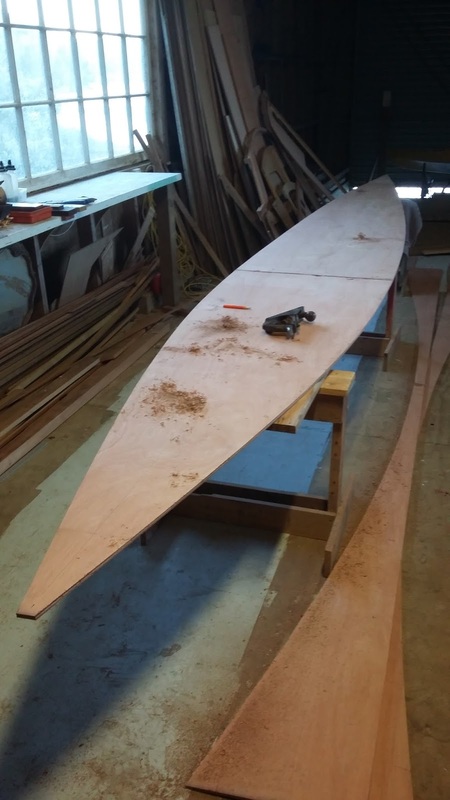 Welsfords first law of seamanship, "Keep the water out" starts back on the drawing board and is a factor in every stage of the build, and of course that also applies when she's sailing. I’m also working on B#4. Having several jobs on the go at once means that if one is waiting for the glue to set I have others to carry on with. B#4 is the one at the after end of the cuddy, and the forward ends of the seats and of course the “off centercase. Its also the forward end of the ballast tank, busy piece of work! 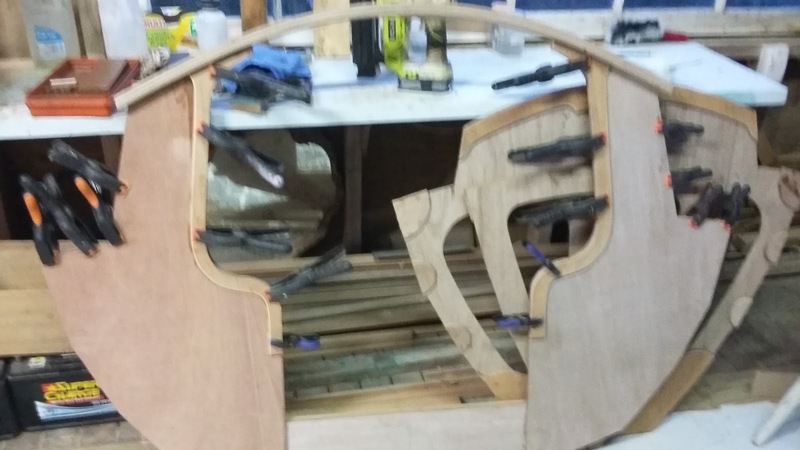 So I’ve put the seat supports on, the web across the bottom which supports the cockpit floor, the doublers on the edges of the opening and the laminated beam across the top that supports the after edge of the cuddy roof. I was asked the other day why I bother putting doublers on the exposed edges of the plywood where it overhangs, easy, not only is it stronger and better looking, but if you get thumped up against the edge of a piece if 6mm plywood it hurts, really hurts. If that plywood is doubled up thicker its possible to put a nice rounded edge on it which will hurt somewhat less. I’m a bit allergic to pain, try to avoid it where possible so a little bit of work at this stage is worth the effort. Lots of clamps, that green thing on the bench behind is my Ryobi cordless nail gun, a huge timesaver for work like this but those pieces being held by clamps are too thin for the only length stainless steel nail I can get here so its spring clamps for those. Here "tis with more bits on, these are the seat supports, angled slightly for comfort. Note that the offcenterboard case forward end log goes on the starboard side so there is no doubler there for the seat front. 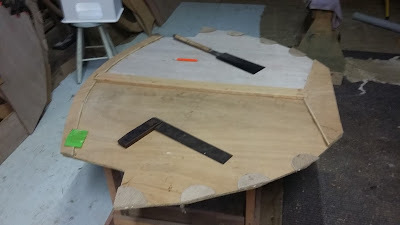 Tomorrow I’ll be marking out B#5, that will about use up the second sheet of 9mm plywood. So far I’ve got through ½ sheet of 6mm and have really only scraps of 9mm left from 2 sheets. I’ve not done a bill of materials yet but it looks like 5 sheets each of 6mm and 9mm, that’s not counting the (off)centerboard and rudder blade, which may end up being made from fiberglassed plywood. Lets see how I go when I get that far along. Its been a nice day out there, not so cold that the epoxy wont cure, and pleasantly light in my little shop by the river. More tomorrow, I’m looking forward to it. Meanwhile, this evening I’ve had my dinner and am sitting in my armchair with a hot cup of tea, dog curled up by my feet, the river rocking the ship a little and I’m listening to this extraordinary guitar music as I write and browse. There are some nice little video clips on YouTube, little windows on summertime. Sometimes its nice to sit and watch others enjoying the warm and sparkling waters. Thanks guys for posting those, they're a delight to watch when the weather is as it is here in the Southern winter. This blog is worth watching, there is quite a lot of information in there on cruising in open boats. Good reading! Here is a thought for the day. “Houses are but badly built boats so firmly aground that you cannot think of moving them. They are definitely inferior things, belonging to the vegetable not the animal world, rooted and stationary, incapable of gay transition.